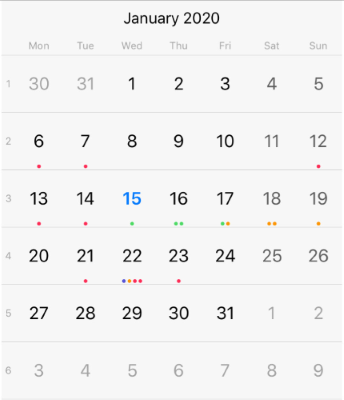 TKCalendar is a highly customizable calendar component that offers different view modes, animations, great performance and customization options. Its EventKit data source helper allows for easy importing of events from the device. Different view modes: week, month, year, month names, year numbers, flow. Easy way to import device events by using the EventKit framework. Transition effects when switching between calendar pages. Different selection modes: single, multiple, and range selection. Overriding the default calendar appearance with themes and custom cells.